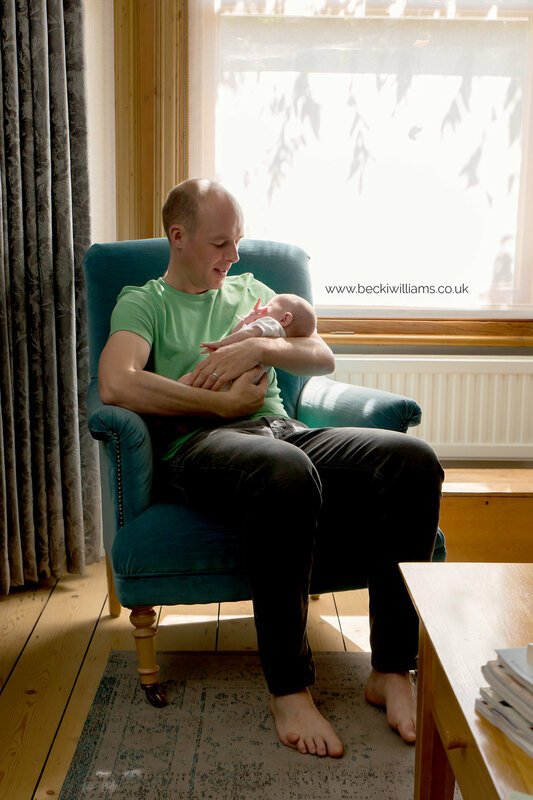 It doesn’t matter if your newborn is awake or asleep so lifestyle shoots generally last between 1 & 2 hours with plenty of time for cuddle, feeding and changing breaks. I really do meet some lovely families in this job Carys’s family were no different. They welcomed me into their beautiful home as if I was a friend and I hope I made them feel as comfortable as they made me. We used three main locations in their house; the living room, bedroom and nursery as well as some outdoor photos to finish. They weren’t the biggest fans of posing so I tried to keep things simple with family cuddles where they could give Carys all their attention and try to forget that I was there. In the past I have had a parents say that it was nice to actually enjoy a few uninterrupted minutes together - something there hadn’t been much of in the craziness since having a baby. I love a good loft conversion bedroom! They are generally a nice neutral colour and have lovely window light - two of the main ingredients of a photographers dream location. I am of course also very jealous as my loft is the size of a postage stamp. Carys’s cot is the perfect way to show just how much she will grow in such a short amount of time. Soon that mattress will be lowered as she learns how to sit. Then before you know it she’ll be using those bars to pull herself up to standing. I really do enjoy lifestyle photo shoots. They are so relaxed and I feel I get to know the families so well. It was really lovely to meet you little Carys and I hope I get to photograph you and your family again in the future. Why not have cuddles on the sofa, sit in some lovely light for some beautiful feeding photos, take a stroll outside or just let me capture those tiny toes for you to remember for forever. Get In Touch to book your Lifestyle Newborn Photo Shoot.